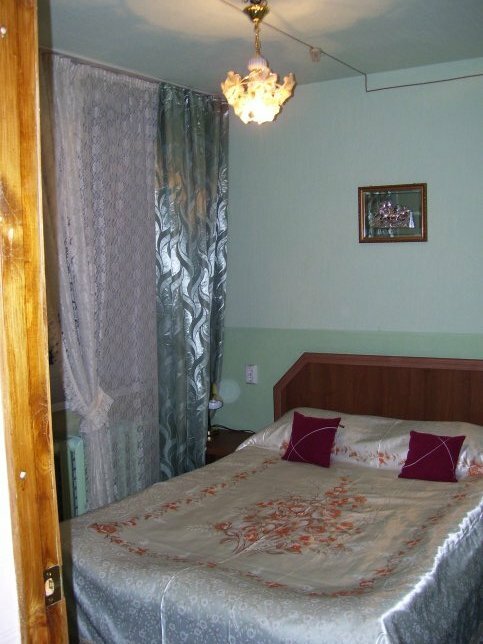 I'm attaching pictures we made of Astrakhan and our room. We are staying at the Hotel Azimut in Astrakhan. 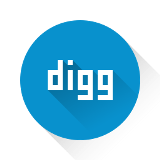 They are going through major renovations right now. It's kind of funny to see the interior design mix. The lobby is decorated in Art Deco while the rooms are decorated in traditional Russian decor like lace curtains, handblown glass chandeliers, oriental rugs, and silk bedspreads. The place reeks of smoke and it's really getting on my and Bill's nerves. They don't appear to have smoking and non-smoking rooms and although they do have non smoking areas designated, no one adheres to them (that goes for the whole country). Picture 1 is of our bedroom in Astrakhan the room is a "mini-suite". I do mean "mini". We have a small sitting area outside the bedroom with a loveseat, desk and TV. Inside the closet is a pretty good size refrigerator. And then we have a bathroom that is almost the size of the bedroom. 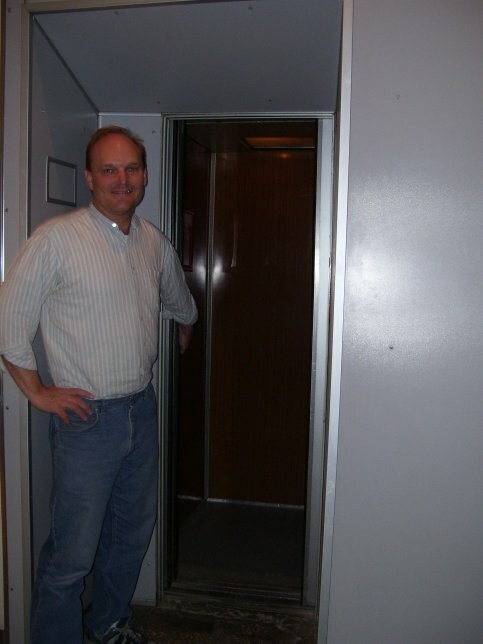 The 2nd picture is of the elevators. They are the size of a phone booth. Bill and I barely fit inside one. And they are on a weird run pattern. You never know how long it will take to get an elevator, 1 minute or 10. They are doing repairs and renovations everywhere within the hotel and often the stairs are closed (can anyone say OSHA violation?) . Our hotel room door lock requires a key on both sides of the door. We were only allowed one key. So, if one of us leaves the room, we either have to leave the other in the room unsecured or lock them in. Let's hope there's no fire before we leave! 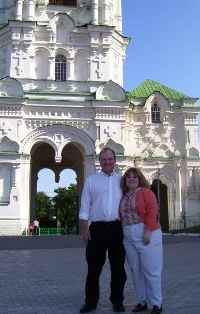 The next picture is of us in front of the Kremlin Cathedral (the Astrakhan Kremlin, not the famous Moscow Kremlin). We were not allowed to take pictures of the cathedral inside. But, it is very ornate. Lots of oil paintings of saints, lots of candles burning and even above-ground coffins that hold the remains of famous Russian saints. Lots of things painted or covered in gold. The last shot is of one of the thousands of stray dogs they have. It's really hard to see these animals out on the street. But they are not aggressive. They are just living their lives on the streets, living off of scraps I guess. 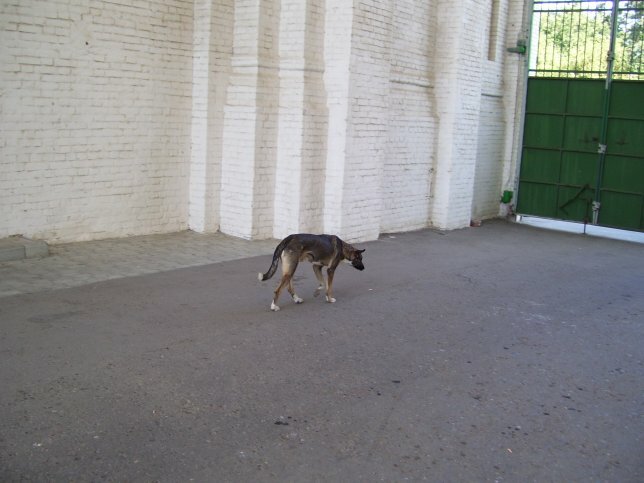 We asked our interpretor about the stray dogs and if Russia had animal control or a humane society and she said no. She agreed it was a problem, but it's just not a priority for the country.